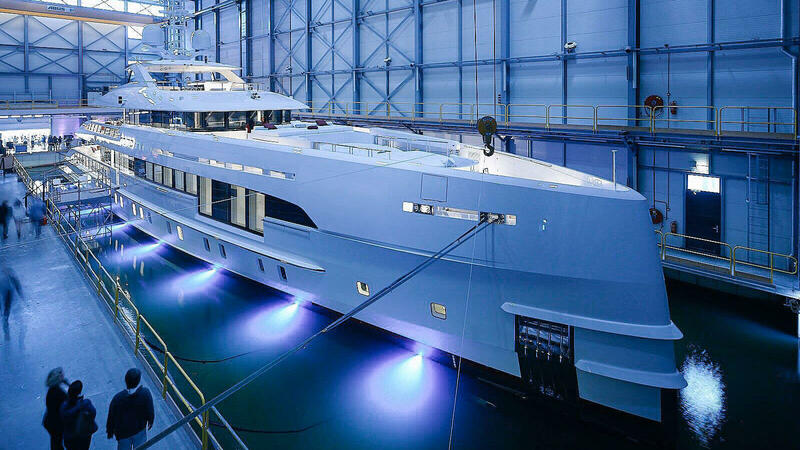 The 49.8 metre Heesen superyacht Project Nova has been launched in Oss and named Home. Construction began on speculation and the project was sold in July 2016, with the client bringing in Italian designer Cristiano Gatto to transform the interiors of Project Nova. The owner is described as a yacht enthusiast who has owned multiple yachts before, however Home will be their first Heesen. Delivery is scheduled for June. 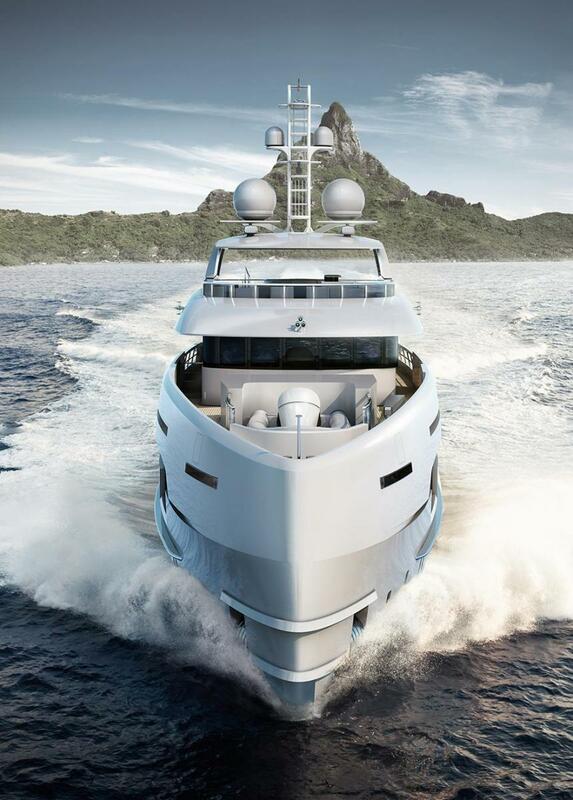 Thom Conboy from Heesen Yachts USA said: "The client was attracted to this project for several reasons including its unique and modern exterior as well as its modern, high-tech interior design." This can be seen in the use of matte finishes, linear styling and freestanding Paola Lenti furniture. Gatto explains that there was a strict colour palette of white, grey, silver and burgundy, with the different materials and finishes used to create a distinction between areas. The woodwork is split between brushed spruce and grey Koto, while the en-suites have been fitted with Nero Setta and Bianco Neve marbles. Key features include the superyacht sundeck, which boasts a 4.8 metre bar area finished in translucent Corian and sheltered by a large hardtop, while a circular superyacht spa pool is situated aft. Al fresco dining is provided on the upper deck aft around a circular table, while the upper saloon features Flexiteek flooring and loose furniture, blurring the distinction between interior and exterior spaces. The main deck features a similarly relaxed, modern style — a glass-sided veranda leads into the main saloon, with its L-shaped sofa and indoor dining area, which seats ten guests around an extendable rectangular table. This all-aluminium yacht introduces a new breed to Heesen’s lineup — adding a hybrid propulsion system to the innovative Fast Displacement Hull Form (FDHF) that was developed by Van Oossanen Naval Architects. Heesen Yachts built the world’s first FDHF yacht with the 65 metre Galactica Star and has since built three yachts with fast displacement hulls — the 42 metre Alive in steel; the 50 metre Sibelle in aluminium; and the 55 metre steel Azamanta. Unlike Galactica Star, which was built for speed, Home is focused on high efficiency. 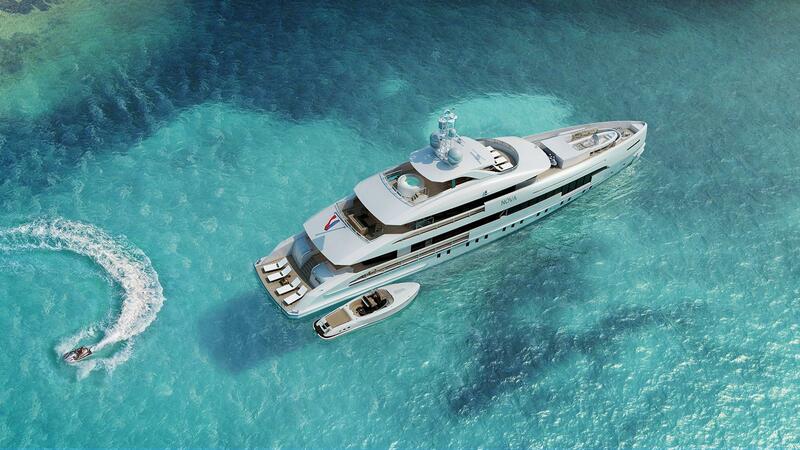 According to Heesen, she will burn 98 litres of fuel per hour at 12 knots and only 57 litres per hour at 10 knots. Despite being powered by relatively small engines for her size — twin 804hp MTU 12V 2000 M61s — Home will still achieve a respectable top speed of 16.3 knots when powered by her main engines, and the diesel-electric propulsion system will allow for silent cruising at up to nine knots. Smaller engines mean the yacht will also be more spacious, with less space taken up by the engine room. With a particular attention to weight control, Home is predicted to achieve a transatlantic range of 3,750 nautical miles while cruising at 12 knots, despite carrying just 45,000 litres of fuel. Home also puts a priority on silence, the ultimate luxury. Heesen’s Mark Cavendish predicts that Home will register 46 decibels of noise in the owner’s suite while cruising in electric mode. “The owner and guests will enjoy a vastly quieter environment,” said Cavendish. To put this in perspective, 46 decibels is the equivalent volume level of soft rainfall. Exterior styling comes from Frank Laupman of Omega Architects, who has penned the striking superstructure and an almost vertical bow, which will reduce vertical acceleration, thus improving on-board comfort. 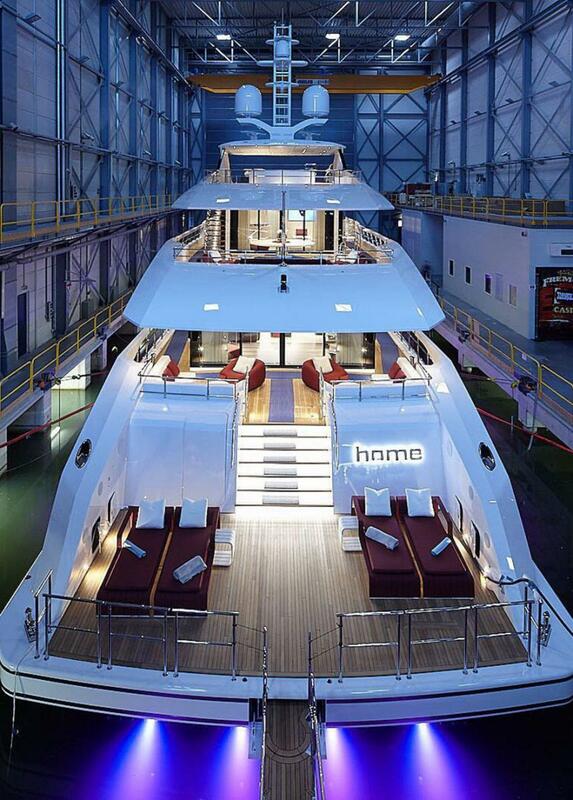 Home is a “modern, innovative yacht with striking lines and a lot of glass,” said Laupman. “More like a beach villa in style, with nature all around you.” This effect is enhances by cutaway bulwarks and floor-to-ceiling mirrors that help to bounce light around the spacious interior. 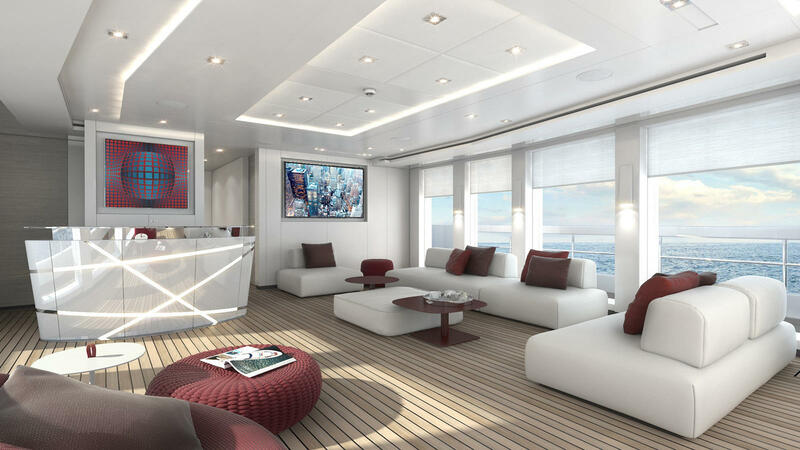 Home will accommodate 12 guests split across six staterooms, including a main-deck owner’s suite with it’s own superyacht office and walk-in wardrobes. On the lower deck, the guest accommodation is separated from the engine room by the superyacht gym, which has been fitted with a Technogym exercise bike and a set of Bow Flex freeweights, while a zero-speed stabilisation system further enhances her blue water cruising credentials. Tender storage is provided via a foredeck crane, leaving the transom clear for guests to enjoy the large fixed swim platform. Following her debut season cruising Norway and the Mediterranean, Home will cross the Atlantic with the aim of making her public debut at the 2017 Fort Lauderdale International Boat Show. The owner was particularly drawn to the yacht’s shallow 2.1 metre draught, which makes her well suited to cruising the Bahamas. Other superyacht projects currently under development at the Dutch yard include the 55 metre Project Alida, which is due to launch before the end of the year.